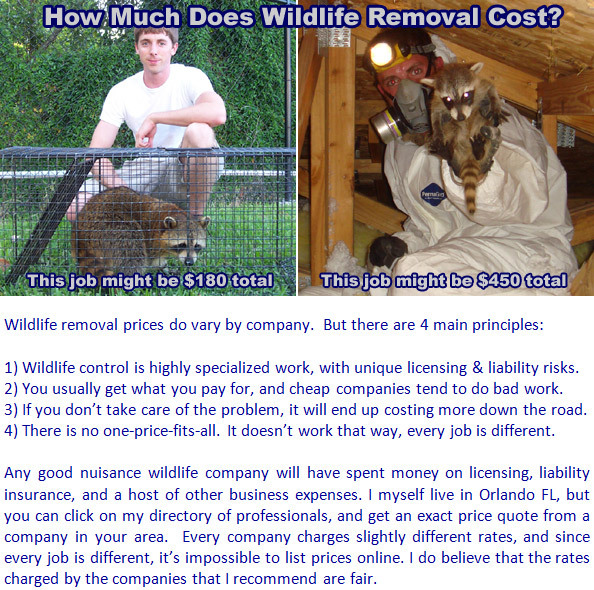 ﻿ How Much Does Wildlife Removal and Pest Control Cost? The best thing your can do is call a company, explain your wildlife problem, and ask for a price estimate over the phone. In many cases, it's hard to give an exact final price without seeing the job - different wildlife removal jobs can vary wildly. A simpler job, such as trapping and removing a single raccoon that's pooping in your pool might be as cheap as $150 for the two service trips (and relocation or euthanization work) required to get the job done. But the removal of a mother raccoon with young from the attic, with proper damage and exclusion repairs and attic cleanup can often cost $400 or more. Large bat control projects with complete sealing of all entry points in a building might be $1000 or more. But a good company should be able to give you an idea, and a price for a service and inspection and trap setup. Beware companies that offer a free inspection. They usually end up aggressively charging more for the job in the end. Above all, hire a company that is available to come out and do the work, and who sounds professional, knowledgeable about wildlife control, and polite and courteous.